Libby Glucksman outside her tailor shop. 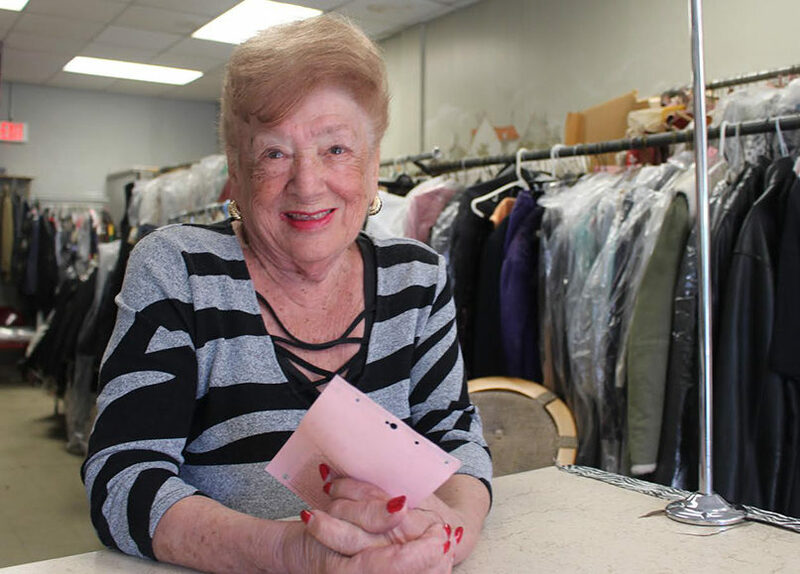 NEW HAVEN – As she prepares to close a tailor shop that was a fixture in New Haven’s West River for five decades, Libby Glucksman has a lot of boxes to pack. She has even more of a story to unpack. A survivor’s story. Libby Glucksman’s late husband Sidney used to tell his version of the story. He was always the one to talk with reporters, students, historians, and friends about how he survived the Holocaust, as the couple ran Sidney’s Expert Cleaners and Tailors in the heart of West River’s changing commercial crossroads at 1567 Chapel St. by the corner of Norton. 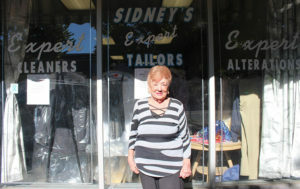 Sidney’s Expert Cleaners and Tailors’ last day of business will be Nov. 15. Sidney died in 2014. Libby kept the place going. Now, at 87, she’s finally retiring. As she conducted business one day in mid-October, she also took time finally to tell her own tale of life overcoming adversity and living on her own terms. Hers is a story of surviving the Holocaust from the woods of Ukraine, of supporting the Russian partisan resistance against the Nazis, of migrating to New York without a penny to her name, and of moving to New Haven and co-founding and co-running Sidney’s Expert Cleaners and Tailors since 1969. 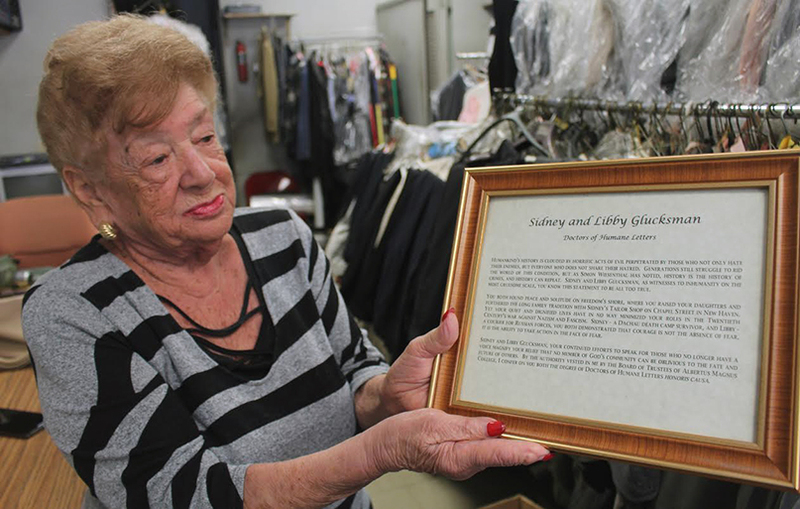 Standing before a forest of cellophane-wrapped jackets, dresses, and suit pants, Glucksman recalled the half-century-long history of her and her husband’s business in New Haven. As sunlight poured in through the three floor-to-ceiling windows that make up the long and narrow storefront’s façade, she also remembered the harrowing years that preceded her migration to the United States. Glucksman was born and raised in the early 1930s in a small rural town in western Ukraine, which was then a part of Poland. As Adolf Hitler and the Nazi Party consolidated power in Germany and embarked on a campaign of mass extermination of Central and Eastern European Jews, Glucksman’s family along with other local Jewish families were forced to move into the town’s small Jewish ghetto. The Germans and the Soviet Union invaded Poland in 1939. German soldiers and Ukrainian allies routinely rounded up young Jewish men in her town, purportedly to take them to work, but actually leading them to execution. So Libby ran away. At nine years old. She and her sister joined up with her brother Joseph, who was an active member in a group of Russian partisans who worked to attack and undermine German operations in Ukraine. While her brother and his fellow resistance fighters snuck out at night to place bombs under German trains, she joined a cohort of the partisan resistance living in the woods outside of town, where she helped prepare food, weave clothing, and dress wounds for the fighters and their allies. After five years spent hiding in the woods and aiding the partisan resistance, Glucksman returned to her small hometown, ravaged by war and the decimation of its Jewish population, in 1945. Soon thereafter, she made her way to the Bad Reichenhall displaced persons camp near Salzburg in the American-occupied section of Germany. It was at Bad Reichenhall that she met Sidney Glucksman, a teenager from Poland who had survived six years in Dachau concentration camp. Sidney emigrated to New York City in 1947 to live with the family of Jerome Klein, a U.S. soldier who helped liberate Dachau and with whom Sidney would form a life-long friendship. On Dec. 24, 1948, Libby made her own way to New York on the same ship, the Marine Marlin, that her soon-to-be husband sailed on one year earlier. She lived with her aunt, who had an apartment on 147th Street in the Bronx. She and Sidney married in a small ceremony in 1949. So she and Sidney decided to move to New Haven, where a fellow Dachau survivor Sidney knew lived with his family. 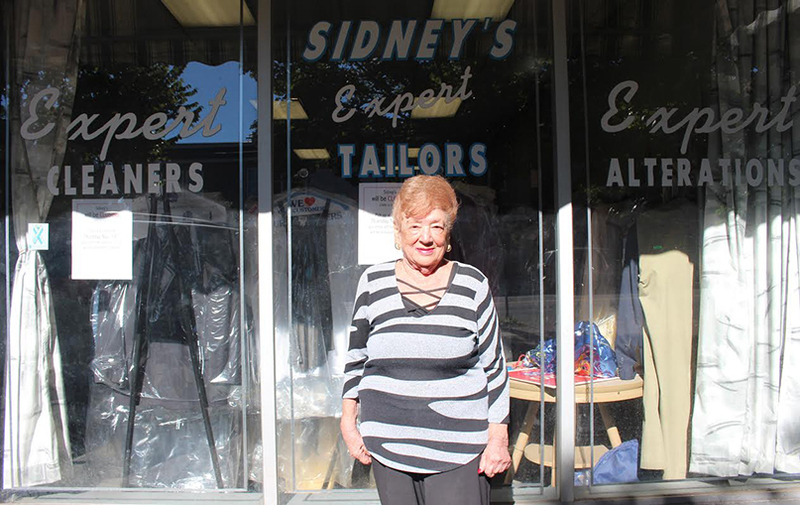 A trained tailor, Sidney quickly found work sewing and mending clothes in the Elm City. Libby remembered that he worked for a tailor named Fred Feinstein near Yale’s campus, then spent over a decade working for Pride Cleaners on Whalley Avenue. While Sidney worked at Pride Cleaners during the day, she said, he would spend his nights working in the basement of their home near Yale-New Haven Hospital on clothing orders that he picked up himself from wealthy clients in Woodbridge. Libby, meanwhile, was also getting an education in tailoring. She worked at a clothing factory on Grand Avenue, where she learned how to sew buttonholes. She and Sidney had two daughters, whom they raised in their home in Beaver Hills, where Libby still lives to this day. In 1969, Sidney and Libby opened up their own shop at 1567 Chapel St. The business has been in that very same spot for the past 49 years as the neighborhood’s once sizable Jewish population moved to Westville or Beaver Hills or the suburbs. “He was very famous,” Libby recalled with pride as she rifled through two cardboard boxes heavy with laminated newspaper articles and community honors that she and Sidney racked up throughout their decades in West River. She and Sidney were proud members of a large Holocaust survivor community in New Haven and the surrounding area. Sidney jumped at every opportunity he could to share his story. Middle school and high school students routinely spent hours after school and on weekends sitting on the floor beside his desk, which was always piled high with multi-colored threads and needles, to listen to the stories he told about the horrors of life in Dachau. A steady stream of doctors and lawyers and politicians and other West River neighbors came in and out of Sidney’s doors over the decades. Former Mayor John DeStefano used to drop off big platters of cookies every Christmas. U.S. Rep. Rosa DeLauro was a regular customer. When Steven Spielberg was working on his movie Schindler’s List, she said, the Hollywood director sent two employees to the Glucksmans’ Beaver Hills home for background interviews about the Holocaust. And in 2010, Sidney became the subject of his own documentary, “Threads,” made by Cheshire filmmaker James Campbell. She said that one of the high points of her and Sidney’s lives came in 2002, when both received honorary doctorates of humane letters from Albertus Magnus College. Libby Glucksman with her and Sidney’s honorary doctorates from Albertus Magnus College. She said that the number of Holocaust survivors left in her synagogue, Congregation B’nai Jacob in New Haven, has dwindled dramatically in the past few years. She was only one of two Holocaust survivors left to approach the bimah during this year’s High Holy Day services. Now, Glucksman said that she is retiring at the age of 87 because she wants to spend more time with her children and grandchildren, who live in New Haven, New Jersey, and Boston. She doesn’t plan on moving from her Beaver Hills home. “I work so hard all these years,” she said, looking out over the rows and rows of cleaned clothes waiting to be picked up from the store one last time. She said that some of the clothes still in the store have been there for years, never picked up by customers who originally dropped them off. Whatever clothes are left unretrieved by Nov. 15, she said, she plans to donate to Jewish Family Services and Goodwill. In August, she and Helena Goldstein and Samuel Lazinger, trustees of the Sonja G. Deutsch 2006 Irrevocable Trust, sold the Chapel Street building to an equity trust company owned by James Kottage and Anthony Annunziato. She said she is not sure what will become of her store after she retires. Thanks to Jason Bischoff-Wurstle and Ed Surato of the New Haven Museum for helping with historical research for this article. This article is reprinted with permission of New Haven Independent (www.newhavenindependent.org), where it first appeared.